"Some classics are worth re-visiting � SpyHunter is definitely one of those classics." When we first heard that SpyHunter was being re-made we were intrigued - especially since it was being made for our beautiful black beast, the PlayStation 2. After all, the original Spy Hunter game was released in 1983 and featured top-down scrolling action. Sure it was fast paced, but 68 colours and a resolution of around 400x400 pixels just doesn�t compare to the beautiful imagery that the PS2 can pump out. Was it even remotely possible to create a game that captured the essence of the original while bringing it firmly into the present? Fortunately for those nostalgia-freaks as well as those who weren�t even around back in �83, Midway contracted a great team in Paradigm Entertainment to attempt to create a modern sequel worthy of the name. 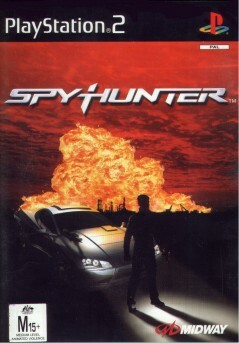 SpyHunter for PS2 is a fantastic driving action game that relies heavily on its ancestral roots while showing off the capabilities of Sony�s latest console. For those of who are unaware of the basic storyline, you are the SpyHunter, an individual contracted to bring down the evil empire NOSTRA, and armed with only a car to do it with. However, the G-6155 Interceptor isn�t just any old vehicle. It comes armed with all manner of guns and missile launchers as well as a defensive array including oil slicks. Not only that, but it can transform into a boat or motorcycle when appropriate. Every element of the original title has been translated into gorgeous 3D. From the Interceptor itself, to the motorcycles, trucks and cars trying to get you off the road any way they can. Even the Ammunitions Truck which you drive straight into the back of to replenish your loadout is retained. Graphically speaking, I�m positive the developers of the arcade version are grinning from ear to ear. Everything has been modelled in 3D and shaded and rendered beautifully. The transitions between the different car configurations are depicted well, and the car itself is very sleek (until you meet the upgrade version that is). The enemies are frustrating, just as they should be. Constantly getting in the way, or trying to ram you off the road, you�ll meet up with motorcyclists wielding machine guns, the unassuming old-style cars that sprout razor-sharp drills from their wheel rims to cut the side of your Interceptor to ribbons, semi-trailers that are happy and eager to make you the meat in their sandwich and various flying and floating machines too, like the barrel dumper and the helicopter that drops bombs from above. There are only 14 missions including the training session, but they�re fun, longer than you expect, and varied. 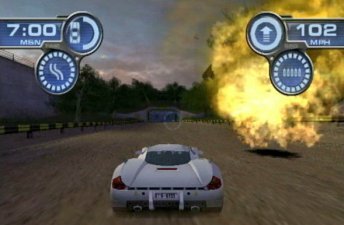 In mission 5 for instance, you get to go up against a NOSTRA agent driving a stolen G-6155 � an evenly matched assignment that really shows whether you can make the grade. Finishing a mission in an extremely fast time can be profitable. Each mission opens up a particular cheat that can be used elsewhere in the game. This can mean the difference between a perfect mission and one that was �oh so close�, so it�s definitely worth trying. Overall SpyHunter is an enjoyable game that keeps you strangely addicted into the wee hours of the morning. It�s a title that will make you want to try each mission again and again until you get that perfect run � congratulations to Paradigm for achieving this excellent conversion.